“Innovate or die” has long been the motto of marketers, tech-savvy entrepreneurs, and those working on the cutting edge of the health and science industries. Nevertheless, the word “innovation” seems absent in the construction sector. The construction industry is one of the oldest and largest in the world, playing a key role in the development and economic growth of all industrialized nations, yet we are using the same basic building techniques we have for over a century. Let’s explore why that is, how the sector can benefit from implementing new technologies, and what firms can do to be part of the innovation wave—because the results point to one key conclusion: the construction industry needs innovation now more than ever. It’s hard for some to gauge what exactly causes companies and industries to innovate, yet the answer is simple: the necessity for change. In the healthcare industry, the bionic eye and artificial heart exist because of the finite supply of healthy, compatible organs needed for the sick and injured. Telecommunication giants push the boundaries of smartphone technology to get ahead in a highly competitive market. So, what’s driving the construction industry? Construction’s last major innovations were during the Industrial Revolution, brought about by population growth and business expansion. Today, the construction sector faces the dawning of another new age, and it has everything to do with environmental protection and population growth. Based on a 2016 World Economic Forum report, the construction sector is the largest global consumer of raw materials in the world, responsible for approximately 30% of the world’s total carbon emissions. In this context, the aphorism “innovate or die” is quite real. Meeting the needs of rapid population growth is contributing to a decline in global environmental resources. The construction industry has a large role in fixing this dilemma. Rising sea levels add to the complexity of the situation. The Environmental Protection Agency estimated that between 1996 and 2011, 20 square miles of land were converted to open water along the East Coast of the United States due to rising sea levels. Thus, the need to re-evaluate how we construct isn’t just pressing—it’s a matter of survival. It is time to prioritize sustainability in the construction sector and it cannot be done without innovation. This requires new technology, new building materials, and new sources of energy capable of maximizing efficiency and lowering our carbon footprint. It is absolutely vital we begin reshaping the industry today. There is an abundance of new technology at our disposal. Utilizing drones for large surveying projects helps cut down on field time, increases survey precision, and reduces safety issues. Drones can monitor sites and report on project progress or potential problems. Virtual and augmented reality can help visualize every step of a project, with a realistic look at the final product. This helps by identifying potential problems early in the design phase—reducing or eliminating the rework process. In turn, there is an increase in the project’s profitability and a resource waste decrease. Waste reduction can also be achieved by using 3D printers already revolutionizing the healthcare and automotive industries. Moreover, these sophisticated printers can aid in creating more complex shapes that can be used in construction. Other than technology, we can explore other building materials that can help reduce our use of raw materials. In the Netherlands, a scientist named Hendrick Jonkers developed the first bio self-healing concrete. When the concrete cracks, water infiltrates the concrete and activates a dormant bacteria that creates limestone. This makes the concrete more durable, lowering the maintenance cost, and reducing the amount of concrete needed. Another example of similar technology is Breathe Brick, which filters air before it has time to infiltrate a building. The bricks are formed from porous concrete and have an inner filter that acts as a vacuum, eliminating 30% of pollutants from the air. Even now, certain construction approaches exist to help lower our industry’s carbon footprint by utilizing sustainable energy sources. In fact, renewable energy can be generated from the daily use of our infrastructure. The State of California is testing the process of generating energy from the vibrations caused by roadway traffic. A company called Pavegen used the same concept to extract energy from footsteps using high-tech prefabricated pavers. Portland Water Bureau and Riverside Public Utilities are also clean energy pioneers, adopting Lucid Energy’s new technology on their gravity fed water system by adding a turbine to control excess water pressure while generating energy. So, why don’t we see these technologies more readily implemented? A 2016 survey conducted by KPMG showed that the construction industry’s biggest hurdle to implementing innovation is the stakeholders’ mindset. Construction companies don’t want to venture on “the road less traveled” in such a risky sector, where a miscalculated move can put a whole company on the line. Because of the aggressive timeline and budget allocated to each project with its relatively low profitability, there is a preference for traditional construction tools and time-tested processes. The other major challenge is the sheer number of players involved in any given construction project and their weight on the decisional scale. For example, a revolutionary material chosen by a developer may not be accepted by a regulatory agency or new VR hardware used by an architect may not be compatible with the old technology used by the engineering firm. The most pressing issue is the lack of investment in research and development within the construction sector. A 2013 EU Industrial R&D Investment Scoreboard shows that the construction industry is at the bottom of the list, with an investment of less than 1% of net sales. What is this telling us? The data shows us that a change in the mindset of the industry and its shareholders is more urgent now than ever—that companies need to start adding innovation in their strategic plans as soon as possible—and that it is just a matter of time before we see the sector’s leading companies embracing this post-industrial era of construction. Sustainable construction with the use of new technology will not only boost productivity and increase profitability, but also create a safer work environment. The use of new technology will also attract more millennials, filling the gap left by the retiring baby boomers. Innovation isn’t just a choice — it’s a must. Merouane El Kaoussi is a project engineer in the Civil Department with over three years of experience covering all aspects of design, permitting, bidding and construction inspection for municipal, institutional and private sector projects. Merouane obtained his bachelor of science from the University of Montreal in 2011 and worked as an EWP Manager for Bell Canada in Montreal prior to his employment with WGI. 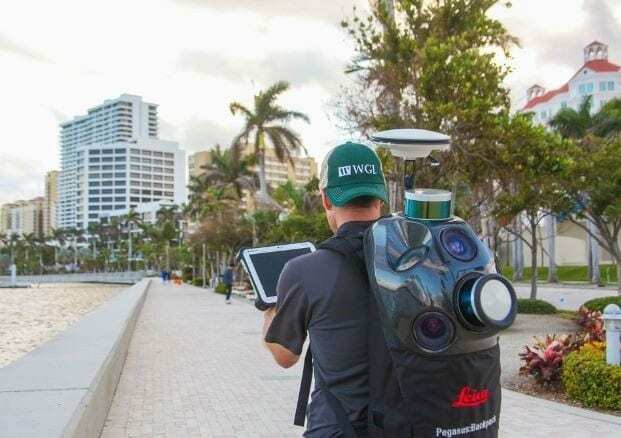 Embracing New Technology: WGI Adds Mobile Mapping… The learning curve associated with adopting new technology can be a significant hurdle for many firms. Will the time and effort be worth it in the long term?